Though it never reached the same heights in the pop culture zeitgeist as "Cat in the Hat" or "The Grinch Who Stole Christmas," "The Lorax" is quite possibly Dr. Seuss' crowning literary achievement. Adapted into an animated 3D feature starring the voices of Danny DeVito, Ed Helms, Zac Efron and Taylor Swift, the film presents a gorgeously Seuss-y world that will delight young movie-goers. Your kids would never guess that it's a cautionary tale about the dangers of rampant consumerism, despite Lou Dobbs' fears. "The Lorax" opens with young Ted (voiced by Efron) trying to win the attentions and affections of a pretty blonde named Audrey (Swift). It turns out that they live in Thneed-Ville, a totally artificial town where all the flora are fake, and Audrey would happily marry anyone who could show her a real tree, leaving Ted with no choice but to find one. Ted's grandmother (Betty White) tells the boy that he should speak to a mysterious man known as The Once-ler (Helms) to learn what happened to all the trees. It turns out that years ago, The Once-ler was a young man bursting with dreams when he first arrived at this once verdant wonderland. He started making "thneeds," a perfectly Seussian bit of nonsense of indeterminate function, from the flowers of the trees. 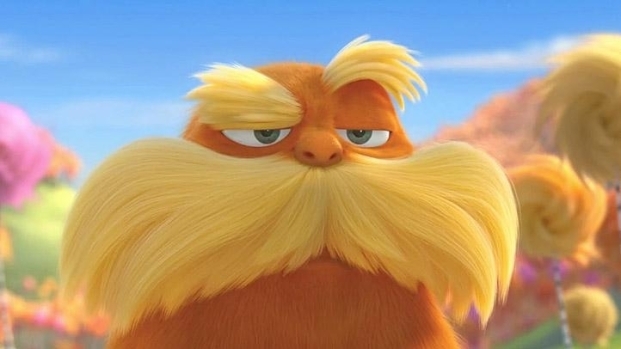 When the Once-ler chops down his first tree, down from the heavens comes a small orange creature with a giant, yellow, push-broom mustache who introduces himself as The Lorax, claiming to "speak for the trees." After some self-righteous nagging, The Lorax gets The Once-ler to promise not to cut down any more trees. Well, faster than you can say, "sustainable development," the last tree comes down and the once-beautiful forest is a desolate wasteland. If you're worried that "The Lorax" seeks to brainwash your child, be warned, the film will make you child think twice about destroying the supply chain for whatever product he or she may produce. Director Chris Renaud ("Despicable Me") and his team of animators have created a beautiful and dazzling Thneed-Ville setting, brimming with remote-controlled trees and flowers packed with spring-loaded bees. The cityscape bends and swirls, with the buildings connected by meandering pipelines in a way that would make Seuss nod approvingly. An animated adaptation of Dr. Seuss' incredible ecological cautionary tale about a boy on a quest to find a tree. Featuring the voices of Danny DeVito, Zac Efron, Ed Helms, Taylor Swift, Rob Riggle and Betty White. Opens March 12, 2012. With Renaud having stayed so true to Seuss' vision, it's both puzzling and frustrating that screenwriters Ken Daurio and Cinco Paul (collaborators on "Despicable Me" and "Horton Hears a Who!") almost completely abandoned the original author's distinctive language. Aside from a few snippets here and there, Seuss's incredibly rich and inventive language is absent. But the duo does a nice job of expanding on the original narrative to create a world within which Seuss' story can be told, and draw a fuller picture of The Once-ler's life that makes him a more sympathetic figure. 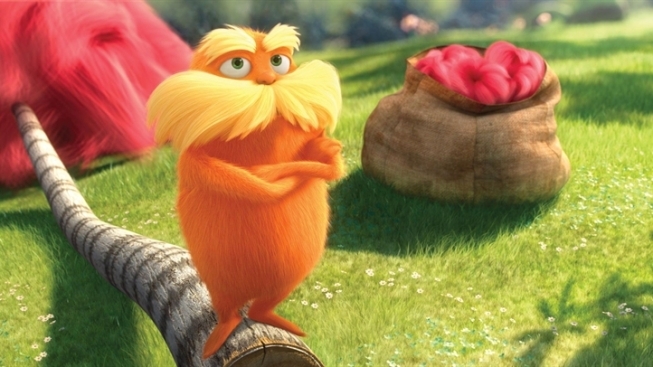 Set aside your expectations for Seuss' legendary wordplay, and "The Lorax" is a clever and fun film for your kids. And they might even, perish the thought, learn how to make money for generations instead of just a few years.